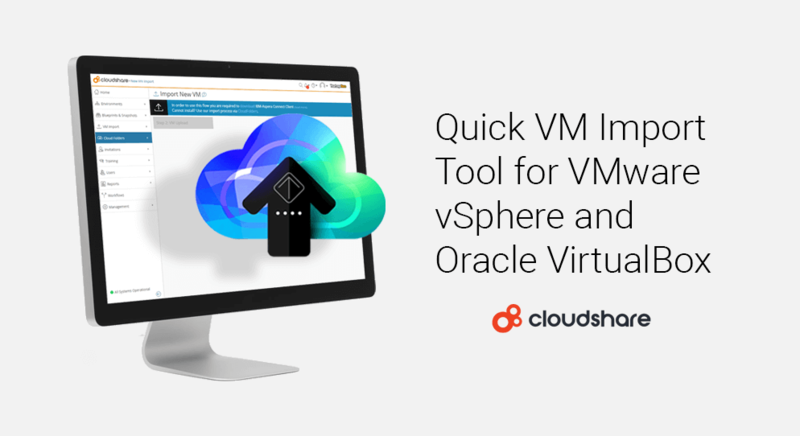 We’re happy to officially announce CloudShare’s new, quick VM Import tool for both VMware vSphere and Oracle VirtualBox. While we pride ourselves on our extensive library of customizable virtual machine templates, with built-in licensing for SharePoint, Linux, Docker and many other applications and operating systems, there are times when the most convenient solution is to import existing VMs and recreate your unique environment in the cloud. This is where our new quick VM Import tool comes in very handy. 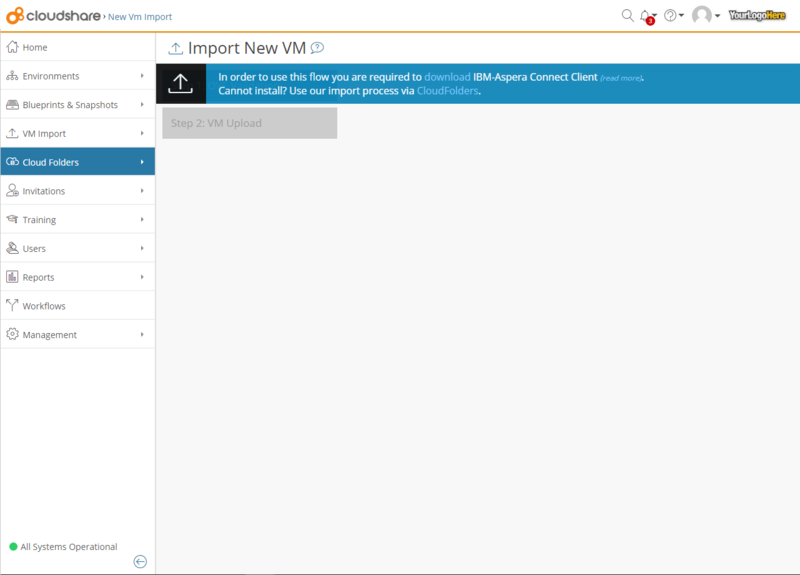 Our new VM Import tool makes it a snap to upload and connect virtual machines using VMware and Oracle hypervisors, so you can easily recreate your own environment in the cloud, regardless of the complexity. Our new tool eliminates many of the challenges usually associated with uploading VMs to the cloud, such as grappling with conversion tools, FTP issues, error notifications that appear after hours of waiting, and unclear or non-existent instructions for resolving them. We, at CloudShare, knew that we could provide our customers with a better experience, after all, we continuously strive to make the cloud a friendlier, more human environment. So, we implemented a high-speed data alternative to FTP, analyzed the most common errors and automated corrections. We can confidently state that we offer the simplest process for migrating your existing VMware and VirtualBox VMs to the cloud (additional hypervisor support coming soon). Not only does VM Import make it easy to bring your VM into CloudShare, but we provide all the connectivity too, making it easy for you to easily replicate your exact environment, that you can clone, train with, test with, and reuse without limit. So, whether using our specialty cloud environments for training, sales demos and POCs, development and testing, support, recruitment testing, or any other purpose, our smart VM Import tool allows you to be more productive and more independent. We know that the faster you can get your systems on the cloud, that faster you can start using CloudShare for the purposes you desire. Our VM Import tool speeds and simplifies the way you migrate virtual machines to CloudShare. Instead of dealing with FTP, grappling with conversion tools, or seeking out special assistance, you simply upload your VMs to CloudShare using our step-by-step VM Import tool. Our import wizard validates your OVF file, immediately alerts you to any file issues, allowing you to correct them immediately, and then starts the upload process, which runs in the background allowing you to continue working on other things. Progress information is available at a glance. CloudShare creates a VM template with default networking already set up. You can add your new VM template to any environment, making it easy to recreate and scale complex environments in the cloud. We work hard to simplify the cloud for our customers. Our VM Import tool is another example of these efforts, allowing technical and non-technical users to take full advantage of the cloud’s power for training, sales demos and POCs, and development and testing. Prepare your VM for import. CloudShare validates your OVF file very quickly and tells you straight away if there’s a problem. CloudShare uploads your VM files in the background. CloudShare connects the VM automatically to Cloud Folders and the CloudShare network. CloudShare’s friendly interface makes it super easy and intuitive to use our VM Import tool. After preparing your VM, simply select VM Import from the menu. Then upload your OVF file for quick validation. CloudShare checks the .ovf file to verify the compatibility of the VM that is being imported. This typically takes up to one minute. If validation is complete and successful, you’ll see a success message. If the validation fails, you’ll receive an error message with the failure reason along with suggested corrections. Our unique auto-correct feature may offer to make corrections for you, which you can accept or override. Upon successful validation, click the Upload your VM button. CloudShare then asks for a few details, including machine and project names, and starts uploading the VM. The upload runs behind the scenes so you can work on other tasks until it is complete. Yet, you can check in on the progress whenever you want. CloudShare automatically assigns an IP address to the new VM template and connects it to the CloudShare network. For more information, contact one of our virtual lab experts, today!